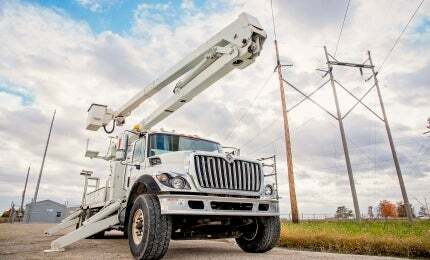 NESCO Rentals supplies aerial devices, boom trucks, cranes, diggers, drills, stringing gear, trailers and speciality tools for a range of industries, including foundation, telecommunications and utility construction. With more than 45 service locations throughout the US and hundreds of new units, as well as 30 years of experience, NESCO maintains one of the largest rental fleets in North America. The company is an authorized distributor, and rental and service provider fotr Terex, Hogg & Davis, Manitex, Sherman + Reilly, Elliot, Versalift, and many more. NESCO’s dedicated service coordinators provide direct contact to a team of best-in-class, factory-trained technicians for fast diagnosis and repairs. Through collaborative relationships with original equipment manufacturers, NESCO provides unrivaled availability of parts. NESCO’s official Canadian distributor, Commercial Truck Company, is also Canada’s largest supplier of truck equipment, carrying cranes, snow and ice trucks, recovery vehicles, utility trucks, dump box trucks, concrete mixer trucks, digger derricks and others. NESCO Renta, located in Guadalajara, provides the same level of expertise and customer service to Mexico. Utility Equipment Outfitters (UEO), NESCO’s newest division, has an extensive range of repair parts, jobsite tools and accessories. These include auger rentals, hydraulic tooling and roping needs. UEO has high-quality buying power, industry relationships and flexible purchase / rental options. NESCO has a comprehensive range of aerial devices for the transmission, distribution, telecommunications, construction, lighting and signage industries. Distribution equipment provides an insulation gap and is ideal for the electrical, cable, fiber optic, and telephone and signage industries. NESCO supplies knuckle 50t cranes with a variety of track and truck mounts. NESCO’s diggers have back easement, track and truck units, as well as sheave heights ranging from 32ft to 80ft, and winch capacities from 3,800lb to 15,000lb. A variety of digger derricks are available on tracks, eliminating many issues caused by unpredictable terrain such as swamps, mountainous terrains, snow, ice, and wet and muddy ground. NESCO also manufactures a complete line of pressure drills and diggers, offering a wide range of drilling speeds, torque, track and truck mount units. In addition, the company supplies stringing equipment and accessories for any voltage. NESCO’s versatile solutions can be used for any terrain and in all weather conditions, while meeting local standards. The company’s rugged and durable trailers are equipped with standard safety features to protect crew members. Professional staff regularly test and inspect each piece of equipment before it leaves NESCO facilities to ensure it is in top condition and meets all current ANSI / CSA standards. Customers can use the company’s new website to browse rental inventory and equipment, create quotes and locate customer service representatives and locations. NESCO, LLC announced today the addition of a new division; NESCO Specialty Rentals.